Vail is synonymous with luxury – fine dining and accommodation coupled with non-stop mountain activities keep Vail mentioned among the word's great ski towns. Vail is located on Interstate 70 about 25 miles west of Summit County at exit 176. Wedged between Interstate 70 and mountains, parking is at a premium, so expect to pay at least $20 a day for a garage spot. Vail boasts many fine dining and lodging options catering to high-end travelers. The largest ski resort in the USA sits above two Bavarian-themed base villages, Lionshead and Vail Village. 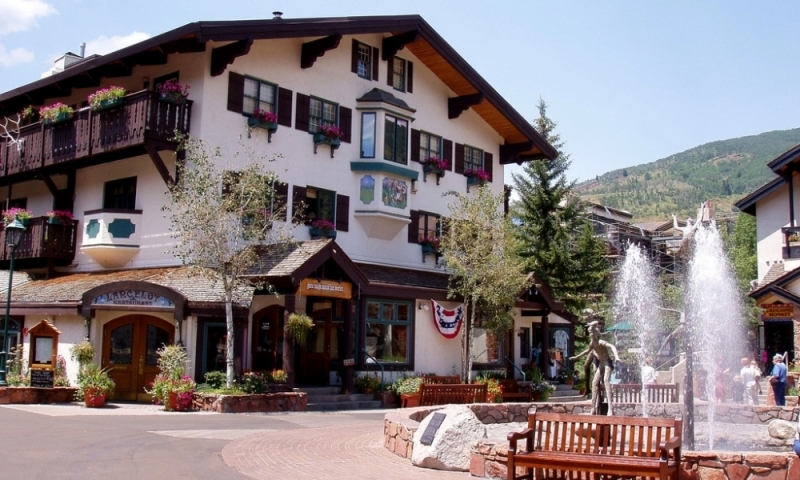 Vail is the absolute picture of luxury with high-end services and amenities. Vail is located alongside Interstate 70 about 25 miles west of Summit County. Vail has every possible service and amenity. You'll not want for extravagant luxuries (two furriers on the same block!) or basic staples like groceries, gas and sporting goods. Great skiing and easy access to the imposing Gore Range ensures Vail remains one of the country's great ski towns. Vail's winter galaxy revolves around the mountain, which hosts events, competitions, festivals and killer powder days. Summer brings world-class mountain biking, rock climbing, rafting, golf and fly fishing. If Vail's fine dining and five-star accommodation aren't enough, then check out the hopping nightlife, summer concert series and annual events, including Teva Mountain Games. The Colorado Ski & Snowboard Museum and Hall of Fame is worth a few hours. Take Interstate 70 west over Vail Pass to exit 176. Vail Pass is a popular backcountry skiing, snowmobiling, off-roading and hiking destination. Parking is $6 per adult in Winter and free in summer. Beware of stunning 360-degree mountain views and lush high-alpine meadows. Eagle Vail is an community resort, providing information on housing issues and local activities. The Vail Symposium strives to educate the community through a variety of interesting and affordable projects.